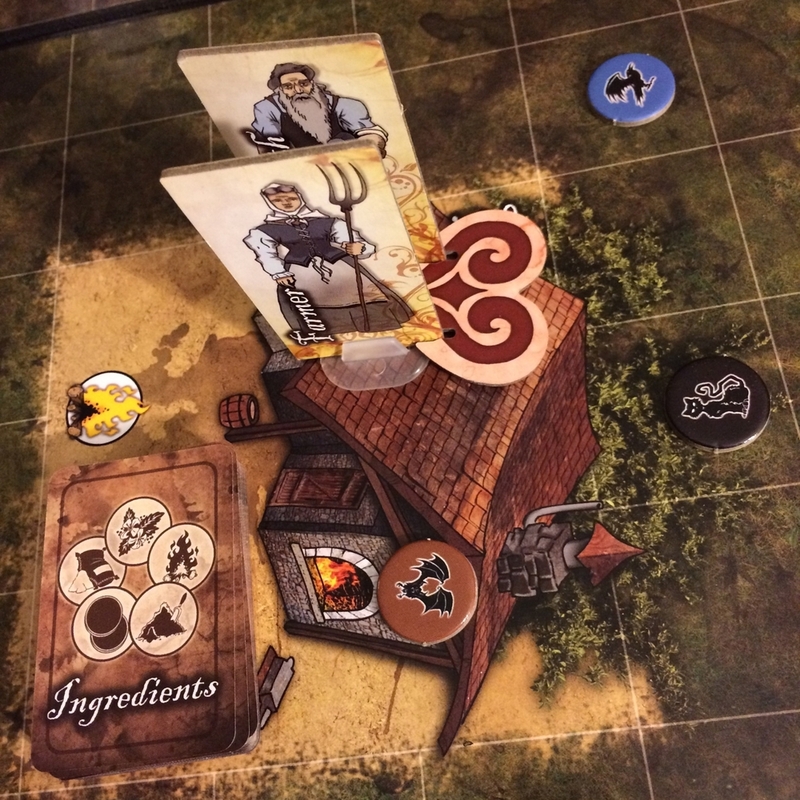 While at Origins this summer, Jeremiah met up with the fine folks of Fireside Games, since then they've prepared to release their next big thing, and that big thing is The Village Crone. 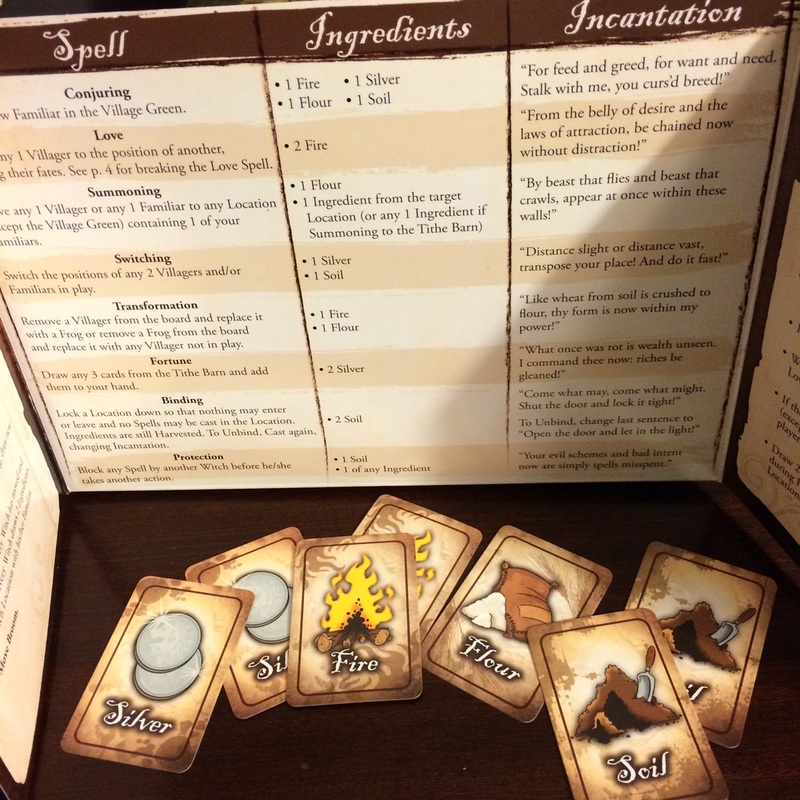 The Village Crone is a game for 1-6 players who will play as witches trying to become the village crone for the town of Wickersby. In order to do that you'll have to score 13 points (because... well... You get it.). So is The Village Crone a keeper, or should you turn it into a newt? Let's find out! 6 Modular boards - these are setup in a 2x3 grid in any way you like or randomly. 4 Decks of Ingredients - There is fire, flour, silver, and soil, each of these will get three eye of newt cards shuffled in. 6 Player Screens - aka, Books of Spells. These are handy player guides, that also show you the available spells you'll need to cast on your way to victory. 3 Decks of Witch's Scheme Cards - Each has a value of 1, 2, or 3 points, you'll need to complete certain tasks (getting characters to certain locations, casting spells etc.) in order to score points by completing these schemes. 6 Types of Familiars - These are essentially your worker tokens that you move around the board in order to gather ingredients to cast spells and so on. The game plays in three different phases that are followed in turn order. First, you tithe, by placing one ingredient into the tithe barn. Second, comes moving and casting spells, in turn order players move either villagers and/or familiars a total of six orthogonal spaces, and cast spells. You can cast as many spells as you like on a single turn, and switch between moving and casting as often as you like. At then end of your turn moving and casting you also get to draw a new scheme card. Third, it's time to harvest. You draw two ingredient cards from any location in which you have a familiar. Lastly you pass the first player token to the left, and you start a new round. Again, first player to 13 points wins the game! Casting spells requires you to have the ingredients necessary as well as repeat the incantation in the spell book in order to perform it. (Or make up your own.) If you're caught not saying it and then attempting another action, you lose all of the ingredients you used in the attempt. Conjuring - which brings out another familiar for you. Summoning - This lets you move a villager to a location with one of your familiars. Binding - Locks a location. Nothing can enter, leave or be cast upon a location that is bound. It must be cast again to unbind it. Protection - Allows you to block any spell cast by another player. You can cast spells and complete scheme cards when it's not your turn as well, however it will cost you one silver! Firestone-- Let's start with the things I like. I like the art style--it works with the theme and is suitably creepy. I also like the main idea. Manipulating the board in order to achieve goals is cool. I like the interplay of everything, and now this spell messes with that person, but I can still make it work if I do this. Everything is a puzzle. What I don't like? Chaos. And The Village Crone has it in spades. There's enough chaos in this that I can't ever imagine playing with 5 or 6 players. Five other people messing with me every turn would make me lose my mind. Jeremiah-- The components are also really well made, and I like the added touch of being able to create your own 3D printed minis. Yes, I am unable to make my own, but it's a cool option that I'm sure kept the price point way down on the game. The interaction is great, the board is constantly shifting, and there's a lot of guessing who's doing what and trying to block them, or at least trying to stop other players from moving the pieces you need out of the ares in which you need them. You're right, it is very much puzzle-like. And I like that a lot! Firestone--I'm not a fan of mechanisms that let you play a card to cancel what someone else is doing. It's usually a Bash-the-Leader sort of move, but here it might also be that you just don't want the state of the board to change because you need it to be just how it is to fulfill your own Scheme. But that doesn't make it any easier for the person whose plan you're wrecking. It might be okay if the original person got his or her ingredients back--you're still messing with them, but it will only delay them for a turn. But the original person still loses his or her ingredients, and that's just a terrible mechanism. Blech. 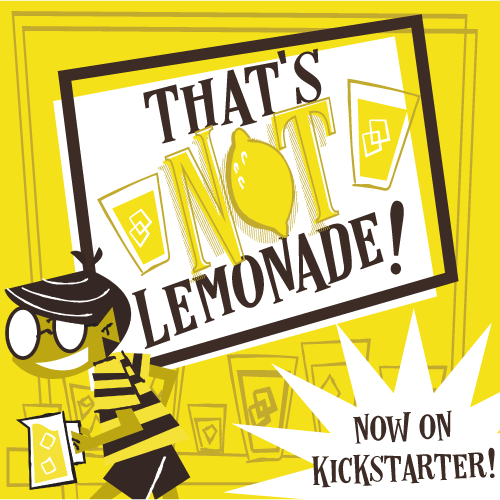 Jeremiah-- Losing your ingredients is a bit harsh, but we found that it often was a defense mechanism, "NO! You can't bind that location! I need to get in there!!" or out of there, whatever the case may be. Losing ingredients makes thematic sense though, since if you were attempting to cast a spell you would have thrown that eye of newt into your boiling cauldron before things went haywire. Firestone--It's also important for us to address the theme of the game--given our theological bent. So obviously the game involves players acting as witches, and then casting spells and manipulating people to do their bidding. But, really, these are fairy-tale witches, so I didn't feel weird as I was playing. (Though I wasn't particularly anxious to play with my kids, so I played with gamer friends.) It was no different than Harry Potter "magic." Of course, your tolerance for any kind of witch stuff might be lower than mine, so just take it into account. Jeremiah-- Yeah. I'll be honest, the theme is a big turn off for me. It's very well executed, but I guess my heebie-jeebie radar went off on this one. I think the thing that sent me over the edge was the strict importance placed on actually saying the incantations. Yes, they're just a step above "Bippity-Boppity-Boo! ", but it made me a bit unsettled. I don't think it's overtly malicious, nor do I think your eternal soul is endangered by playing this game, but sharing this type of feedback is what we do here at ToG, so it's worth noting. Firestone's Final Verdict--If you like your games with a good deal of chaos, and some serious take-that (mostly unintentional, but some intentional), then The Village Crone might be right up your alley. It's not the sort of game I like, but I truly think with the right crowd, this could be a definite hit. Jeremiah's Final Verdict-- Chaos doesn't make me shy away from The Village Crone, the interaction, and tense competition make it worth it. Be aware of thematic elements that are present here and proceed accordingly. If you like a games that have you solving a shifting puzzle like landscape and thinking ahead of your opponents The Village Crone is definitely worth a look!